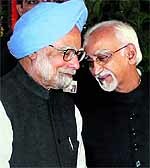 The ruling UPA-nominated incumbent Hamid Ansari is set to re-contest the vice-presidential elections. Ansari�s candidature found endorsement from the Samajwadi Party and the Bahujan Samaj Party, but key ally Trinamool Congress reserved its decision. 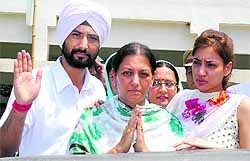 Sukhjit Kaur Sahi of the BJP beat her nearest rival Arun Dogra of the Congress by 47,432 votes in the Dasuya bypoll, the counting for which was held on Saturday. Punjab Congress leaders today held Pradesh Congress president Capt Amarinder Singh responsible for the party�s humiliating defeat in the Dasuya bypoll and urged the party high command to immediately intervene and set things right in the state. 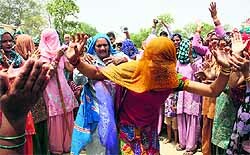 A mahapanchayat of leaders and representatives of over 100 khaps from Haryana, Delhi and Uttar Pradesh took a tough stand against female foeticide on Saturday. Nine Amarnath pilgrims were killed and 21 seriously injured when a bus they were travelling in rolled down into a gorge at Ramban on the Jammu-Srinagar Highway at 11 pm on Saturday. After the management of Vijay Mallya's Kingfisher Airlines failed to pay salaries to all employees on Friday as promised, pilots of the airline in many places across the country went on a strike forcing 40 flights to be cancelled - till afternoon today. Following day-long discussions on the SK Thorat panel suggestions to remove 21 politically and communally sensitive cartoons from senior secondary school textbooks, NCERT�s apex academic body today slammed the report as �deeply inadequate� and said it didn�t offer cogent intellectual arguments for the deletion of cartoons. 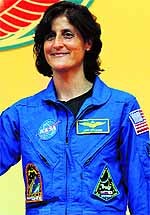 Indian-American Sunita Williams, a record-setting astronaut who lived and worked aboard the International Space Station for six months in 2006, is all set for her second space odyssey.